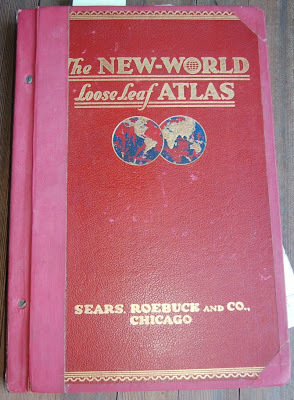 Infinite Art Tournament: 1932 Sears World Atlas! 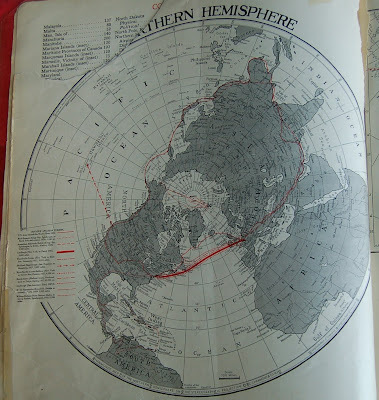 Ma & Pa 5000 scored me a big ol' 1932 atlas! Sweet! 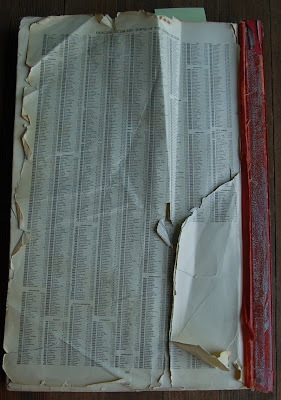 Most people who would get excited about an old atlas would probably want it to be all pristine, but I kind of like it when they are all beat up. That way you can handle them without fear, and maybe chop 'em up if you get the urge. Every age is pretty impressed with its own high tech. Of course, sometimes futurism goes down a dead end. 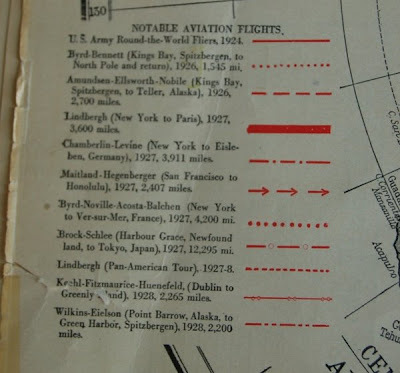 You don't see many maps of "Notable Dirigible Flights" today. People stayed excited about the Panama Canal for a long time. 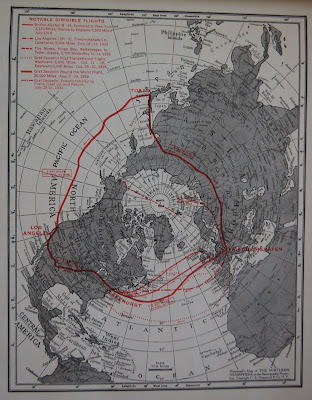 This pair of maps shows how long it took to get places from New York by sea before and after the Canal was opened. 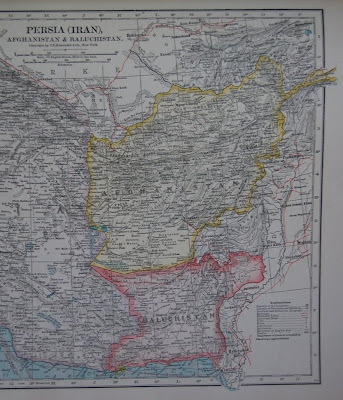 Whatever happened to Baluchistan? It's just the back end of Pakistan now, for all I know. 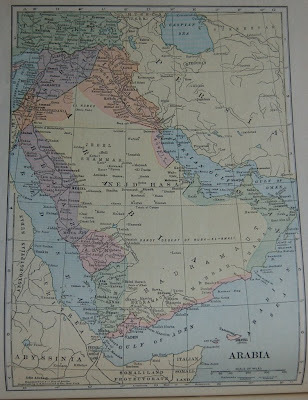 The Arabian Penninsula: from Irak south through Koweit, a very large Oman (in green), an unidentified pink strip leading down to Aden at the southern tip; north along the Red Sea, you've got Yemen (in green), Asir (in pink), and Hejaz (in purple); everything else is apparently the Nejd Hasa. And then you're in Palistine. A lot has changed in 77 years, apparently. 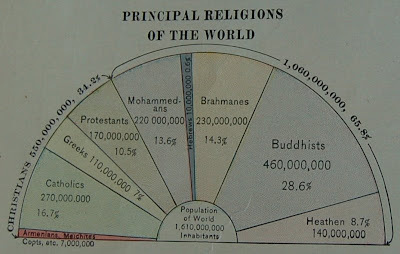 Among other things, this diagram is notable for its dazzlingly inclusive conception of Buddhism. 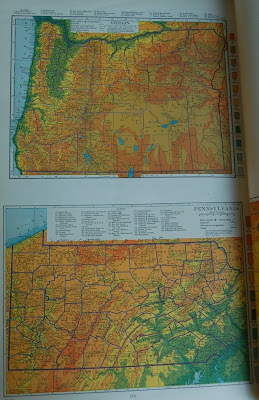 The color is pretty splendidly preserved, making a set of state topographical maps towards the back of the atlas particularly lovely. I am pretty sure that Heathens are under-estimated! 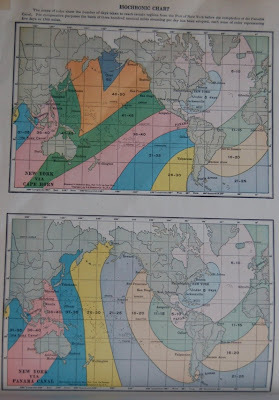 BTW I Live in the bottom portion of the last map shown - maybe right on the cut off line. Which is appropriate for the "Old Line State." 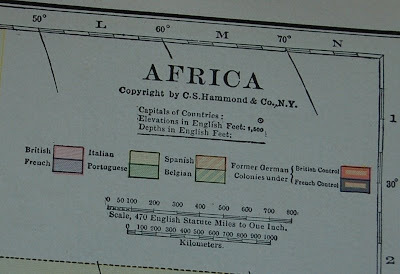 @Calico: No, no, the Hebrews are the dark grey line between the Mohammedans and the Brahmanes. That's stunningly awesome. A potent reminder of how fast the world changes. Yesterday I would have thought Baluchistan was one of your forgotten countries. But I'll bet there are bitter advocates of Baluchistani Independence even today. OK - I'm jealous! Is that the reaction you were going for? Cause it worked. 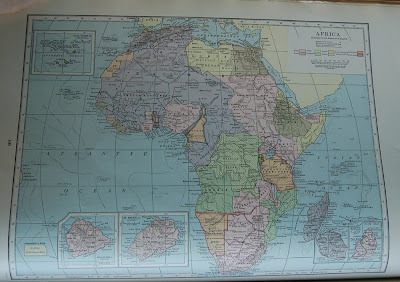 I didn't even know Sears made atlases-or at least put their name on them. Nice find! You are in geek heaven, aren't you?